Home / 2015 / June / Film grad lands fellowship at Democracy Now! Two weeks ago, Juan C. Dávila Santiago’s thesis film was featured at the Del Mar Theater in Santa Cruz as part of UC Santa Cruz’s annual screening of work from students graduating this year from the masters program in Social Documentation. Titled The Stand-by Generation (La generación del estanbai), his documentary examined the lives of a new generation of university graduates in Puerto Rico, caught in the world of part-time and temporary under-employment, struggling to survive. 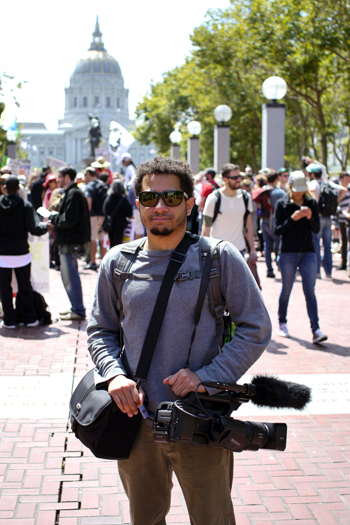 Next week, Dávila Santiago will embark on a new chapter in his own life—he’s off to New York where he landed a one-year News Production Fellowship to work at Democracy Now!. The daily, independent, award-winning news program--hosted by journalists Amy Goodman and Juan Gonzalez--currently airs on more than 1,300 public television and radio stations worldwide, including Pacifica, NPR, and PBS. Dávila Santiago first began directing and producing low-budget short films while he was studying communications at the University of Sacred Heart in San Juan, Puerto Rico. His initial films were influenced by film noir and explored crime and corruption in Puerto Rico. 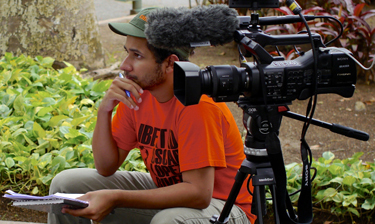 To begin making documentary films, he founded a non-profit organization called Frutos Fílmicos with the aim of not only producing films investigating social and environmental issues, but also of telling stories that mainstream media often ignores. His first feature-length documentary Compañeros de lucha screened internationally at various film festivals and received a distribution deal from Cinema Libre Studio. In 2013, he came to UC Santa Cruz to pursue his master’s degree in Film and Digital Media, with an emphasis in Social Documentation. Santiago noted that his experience in the “Soc Doc” program was instrumental in helping him get the position at Democracy Now!